I swear to you, derby saved my soul! This picture tells my entire story of our bout against Green Country on Sunday. It was a trifecta of pure suckiness. 1) Sitting in the penalty box was literally two-thirds of my playing time. 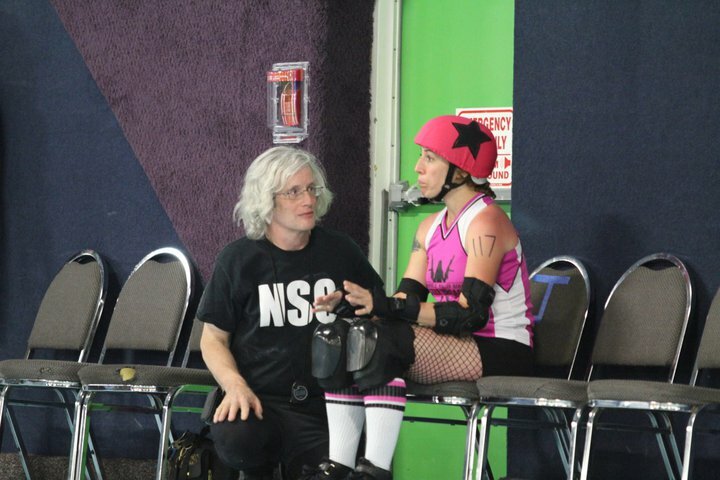 2) This image was of me telling this Non-Skating Official about the time I broke my collarbone, which I was doing because our own Sweet Miss Treat had just given Green Country’s jammer such a solid hit that we believe that girl broke her collarbone. I think I was rocking in my seat—hello, sympathy pains!—discovering a sudden paranoia thinking maybe I shouldn’t be out there playing that particular evening. 3) Moments later, I went out for a third jam and was hit so hard by a girl half my size that I heard a pop and immediately turned into a T-Rex again. I cursed loudly (SORRY MOM!) and kept pretending I was going to keep making it through the pack despite my pain. I could tell immediately it’s wasn’t broken, but after three jams—and yes, two of which I sat in the box—I opted to not go back in and play.